Is Pre-Earnings Season Pessimism a Good Thing? 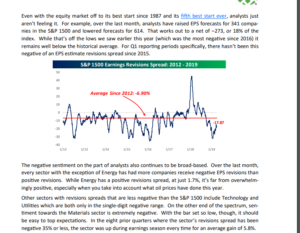 As big fans of Bespoke’s research, the firm published their long-awaited earnings season preview today. 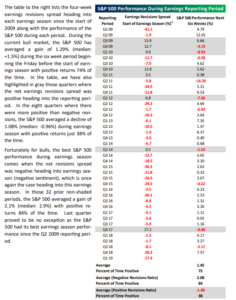 Although the sharp first quarter, 2019, rally in the SP 500 throws a fly in the ointment, the upshot of the sentiment analysis for readers is that the worse the sentiment headed into a reporting season, the better the “upside surprise” for the SP 500 earnings season, and usually the better the market response. My own opinion is that Q1 ’18 is a lot like Q1 ’16, when the SP 500 bottomed in late January, early February ’16, and SP 500 earnings fell 5% y/y according to the IBES by Refinitiv data, which was the bottom of the cycle for that correction for SP 500 earnings growth. I suspect that Q1 ’18 and the current expectation of -2% to -3% SP 500 earnings growth year-over-year will be the bottom for this correction as well. To answer the headline question today, I’d say, “Yes”.